Corazon P. Gonzalez Memorial Foundation, Inc. Participants of the Faculty Development Workshop on Outcome-Based Teaching and Learning Strategies held on June 29-30, 2017 at the NTTCHP Auditorium. Congratulations to members of NTTCHP's Batch '17 (Certificate in HPEd, Diploma in HPEd. and MHPEd). The award was given during APMC's 50th Anniversary Celebration held last February 2, 2017 at Novotel, Cubao, Quezon City. The recognition award was received by Dean Nemuel S. Fajutagana and Professors Erlyn A. Sana and Melflor A. Atienza. They are shown in the picture (3rd, 4th, 5th from left) with other APMC awardees. 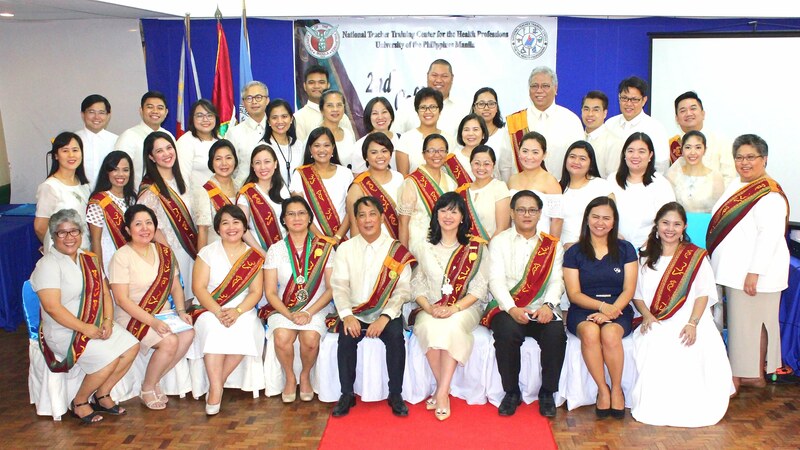 Theme: "Health Professions Education as an Agent for Transformation"
Participants of the 9th National HPEd Conference with National Scientist and Ramon Magsaysay awardee Ernesto Domingo, UPM Vice Chancellor for Academic Affairs Nymia Simbulan, and current and former faculty members of NTTCHP. Critiquing Research slides now available Slides used by Dr. Jesus N. Sarol's during his lecture on 'Critiquing Research' is now available online. Philippine's First Textbook on HPEd now available for only 750 pesos. To order, please call (632) 521.0899 or email us at nttchp@gmail.com. 211 participants from different colleges and universities in the country joined the NTTCHP 8th National Conference held at the Hotel Jen in Roxas Blvd., Pasay City, MM. To view the conference pictures, and access the abstracts and handouts, please visit the 8th National Conference official website.